Rally leader Sandro Bregadze (to the right) and an activist carried an icon of King David the Builder at the head of the march. Hundreds gathered in Aghmashenebeli Avenue, a tsarist-era throughfare in downtown Tbilisi, to protest against Muslim migrants. Arab tourists watched the march through a hotel's gates until they were urged by police and bystanders to go inside. Wearing a rally T-shirt, activist Lado Sadghobelashvili called for closing "Arab brothels." A monk in white strode silently ahead of the demonstrators. Employees and patrons of a Turkish restaurant on Aghmashenebeli Avenue watch the demonstration pass. A rally participant exclaims at Turkish and Arab bars and restaurants along the route. 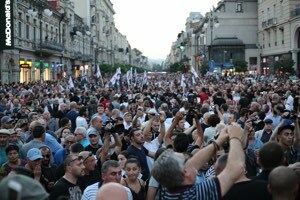 Participants held hands to form a circle around Marjanishvili Square to mark the rally's end. Carrying crosses, icons and flags, hundreds of Georgians marched through an increasingly Middle Eastern retail district in downtown Tbilisi on July 14 to call for an end to Muslim immigration. Various ultranationalist groups took party in the rally alongside less demonstrative residents of the district. Despite the worries of many observers, the rally ended peacefully, except for a fistfight between two participants. The recent arrest of two Indians on charges of sexual violence against minors served to galvanize demonstrators' anger. Additionally at issue were earlier reports of Arabic, English and Latin-letter graffiti found scratched into the walls of the 6th century Jvari monastery and the 2014 arrest of Iraqi citizens on charges of sexually abusing minors. Previously sotto voce grumbling about Turks, Arabs and Iranians allegedly “taking over” the Aghmashenebili area with restaurants and shops – and about Middle-Eastern-run strip clubs elsewhere – also went full throat at the rally. Purportedly at city officials’ urging, owners closed most of the area’s Arab and Turkish cafes, hookah joints and shops for the day. Midway down the avenue, a group of Middle Eastern men with spiky hair and trimmed beards, and women in hijabs peaked through a hotel’s gates with alarm. “Look how they stand there, frightened. 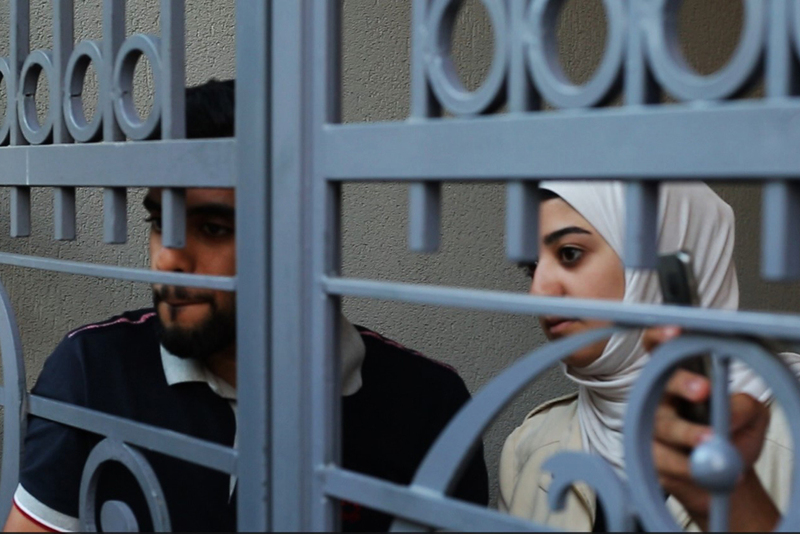 This is so shameful,” one young woman called out to journalists, pointing at the people behind the gates. She, her friends and even a few Georgian reporters went up to reassure the visitors. None of the protesters confronted foreigners, though police maintained a careful watch. Older residents of the area insisted that they have respect for Muslim culture, but said they felt overwhelmed by the fast-growing Middle Eastern presence in Georgia. Others, however, in the neighborhood belted out racial slurs. More liberal Tbilisi residents cringed in anger and embarrassment as they watched the march. Some peppered the event’s Facebook page with insults, calling the participants “bigots” and “Nazis.” No to Phobia, a coalition of civil society groups and thinks-tanks, released a statement describing the rally as a deliberate attempt to fan the flames of xenophobia. The marchers dismissed such descriptions. They insisted that their rally was peaceful and that they are not opposed to diversity per se. Rather, they claimed, the march was meant to push for putting caps on migration and to deport foreign nationals involved in crime. To refute the xenophobia label, they also cited similar causes championed by US President Donald Trump and politicians within the EU. Western-leaning political figures, media and think-tanks charged the event was the result of Russian propaganda, citing similarities to the “Russian March” held annually in Moscow. Stirring up ethnic tensions is widely seen as Moscow’s tactic to keep the ex-Soviet republic within its sphere of influence. Bregadze has long faced accusations of serving the Kremlin. At the rally, Bregadze dismissed these groups as “liberasts,” a combination of the words “liberal” and “pederast.” “We will break down the liberast movement, which is sponsored from abroad and is meant to destroy Georgian traditions,” he said. Yet, for all the tension, the march had a flair of absurdity to it. A unicorn was inexplicably chosen as its mascot and participants had it printed on their T-shirts. The organizers bickered as music often drowned out the speeches and Bregadze, ploughing fast ahead with the icon, was repeatedly asked to wait up for the rest of the crowd. Several Arabs, oblivious to the goal of the rally, happily waved from the balconies. With the area closed to traffic, some cyclists seized the opportunity to ride in circles ahead of the marchers. As the crowd gathered at the march’s final stop, Marjanishvili Square, some onlookers at McDonald’s rolled their eyes at the scene.